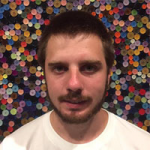 Frank Parker is a double major (GIS & Architecture) undergraduate student at South Dakota State University (SDSU) and works in the design/build shop on the campus where he oversees the operation of the school’s Techno CNC machining center. Frank also teaches a bi-weekly course to certify students in the CNC machine’s safety and proper usage. 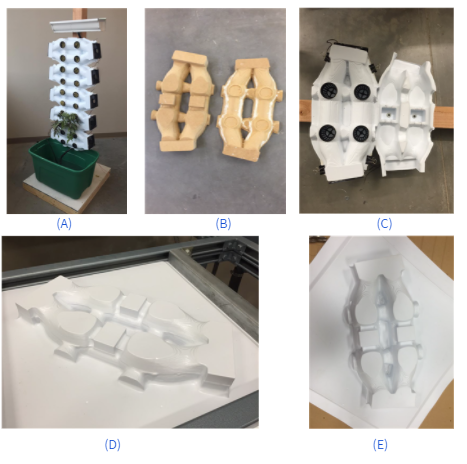 He also assists students and faculty on their design/build projects by performing 3D modeling in Rhino and preparing RhinoCAM toolpaths for machining. Frank and the students designed and built a working hydroponic phytoremediation system, often referred to as a Green Wall. Phytoremediation is a process that uses living plants to clean contaminants in soil, air and water. In the Drip System illustrated below, water is pumped from a holding tank below the wall up to a tank above where it is gravity fed from a drip line onto the plant’s roots in each pod. In this project, each pod was vacuum formed over a core. The core was machined from RhinoCAM toolpaths on the school’s 3 Axis Techno CNC machining center. 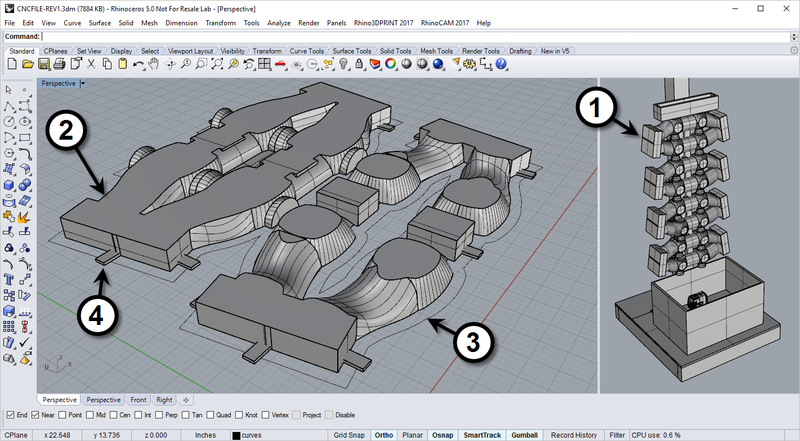 The images below illustrate RhinoCAM’s role in the design/build process. The Green Wall 3D assembly in Rhino along with components for machining. Refer to the more complete description in the text below. In the screen image above we see the complete assembly modeled in Rhino on the right (1). Each pod is a complete unit that is divided into 1” thick sections and laid out for machining. On the left we see two of the sections positioned for machining (2). The offset outer boundary curves serve to contain the cutting to only the areas needed (3). Tabs were modeled on the XY plane that extend from the part out past the containment curves (4). These tabs will help fixture the parts to the stock on the bed of the Techno CNC machine. 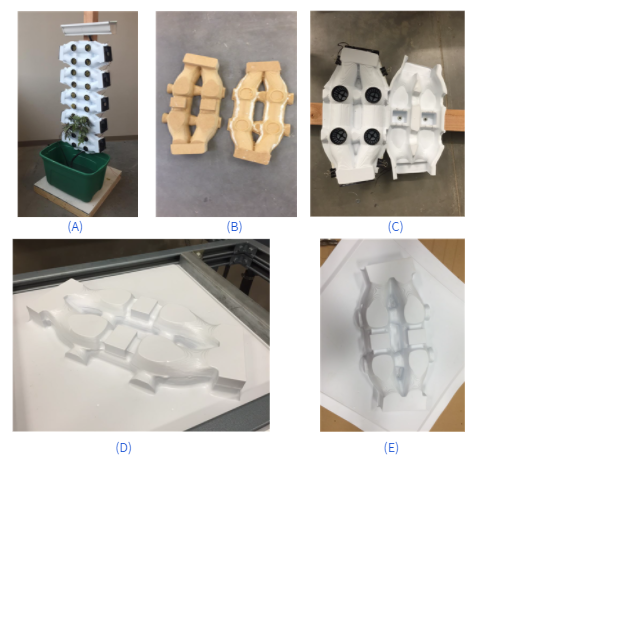 Toolpaths for a section of the Green Wall pod are displayed in RhinoCAM along with the pod core and resulting vacuum formed core halves. Refer to the more complete description in the text below. 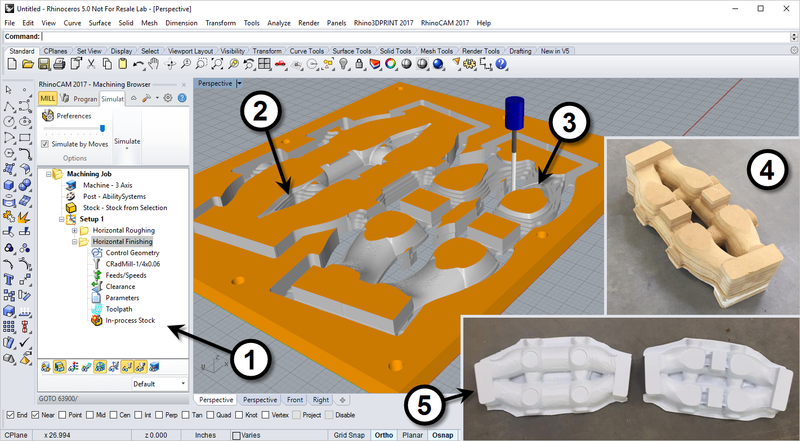 In the screen image above we see the RhinoCAM Machining Browser displayed on the left with Setup 1 containing 3 Axis toolpath operations (1). 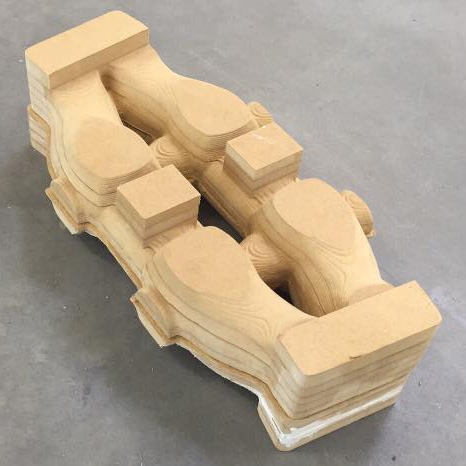 First 3 Axis Horizontal Roughing is used to clear stock material from around the part out to the containment boundary curves (2). Then 3 Axis Horizontal Finishing is the perfect toolpath choice for finishing the near vertical outer surfaces (3). After all sections are machined, the core is assembled in two halves and then sanded. The core haves are shown here lying atop each other forming the completed pod (4). Each pod half is then vacuum formed over the cores. A completed set is shown here (5). A. The working hydroponic phytoremediation system. B. The pod core models machined on the Techno CNC machining center from RhinoCAM toolpaths. C. The core half being vacuum formed. D. & E. The resulting vacuum form prior to trimming. To learn more about Frank’s work at SDSU we invite you to read the complete case study here. To learn more about the programs at South Dakota State University we invite you to visit them at [https://www.sdstate.edu/].